Fox Sports' Ken Rosenthal has a column up today that rightly marvels at the St. Louis Cardinals' ability to consistently win in the postseason. Things take a weird turn, though, when Rosenthal starts referring to the Los Angeles Dodgers as the "Dollars." The Dollars could react violently to the implosion of their record $240 million payroll, perhaps dumping general manager Ned Colletti, who built an expensive but horrific bullpen, and manager Don Mattingly, who had one pitching move after another backfire in part due to his limited options. The Dollars surely will find some new players, too — and, let's hope, some new relievers. But whatever they do, they won't replicate the Cardinals, who beat them with a payroll about half as large and 17 homegrown players on their 25-man Division Series roster. This isn't much more than some playful ribbing, but it's indicative of baseball writers' and fans' very real tendency to make dumb value judgments on the various ways baseball teams are constructed. Teams in big markets with large payrolls are representative of misguided avarice; ones with smaller payrolls and strong farm systems are shining examples of how to do things the "right way." It's a weird way to approach baseball! One of the cool things about MLB is that it provides teams with avenues that simply don't exist in leagues that have salary caps. A GM can only get so clever when filling out a roster is akin to balancing an equation, but baseball allows teams to color outside of the lines. All different sorts of team-building philosophies are allowed to bloom. Over in St. Louis, where the dedication of the fans isn't quite enough to overcome the fact that there aren't that many of them, the Cardinals have to make every dollar they spend count; this makes it especially impressive that they've made four straight National League Championship Series. That doesn't mean the Dodgers are trash, though. Their higher-ups will tell you that they're a lot more interested in winning a World Series than some payroll efficiency title, and if it hasn't worked out so far, so it goes. They—like the Cardinals—are a well-run ballclub, making good use of what they have to work with. Setting up some sort of conflict between the two teams' approaches is silly. 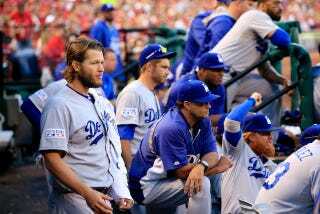 If the Dodgers had won the NLDS behind some brilliant Clayton Kershaw pitching and Yasiel Puig longballs, that wouldn't prove the Cardinals' approach is antiquated and irrelevant; neither is the inverse true. An organization spending a lot of money on players who can help them win games isn't making a dopey miscalculation that should be ridiculed or called out as objectionable when things don't work out all the way, any more than one that spends as little as it can get away with is necessarily to be scoffed at for putting profits ahead of wins. A large payroll doesn't point to a team's stupidity; a small one doesn't guarantee its pure-heartedness. The Cardinals are a well-run team full of good players who have (so far) come through when it counts. That they've done so doesn't say anything bad about the Dodgers, other than that they lost to a good team. That's how baseball goes.